Bright Green Beam is the optimum system for illuminating projecting signs and ideal for edge lighting light boxes. The new system is a development of the existing Bright Green Beam edge lighting system and now comes as a fully encapsulated, IP65 rated module, making it more robust and suitable for outdoor use. This new LED system complements Bright Green’s existing range or lighting solutions for signage. Based on a state of the art design Bright Green Beam™ ensures uniform lighting without the stripes associated with fluorescent tubes. This is made possible by the specially designed lensed LEDs that redirect otherwise wasted light towards the lit surface, ensuring maximum brightness. Bright Green Beam™ is ideal for illuminating single and double sided projecting signs and lightboxes with depths greater than 50mm. Using LEDs specified and optimised for close binning, high lumen efficiency and lumen maintenance, Bright Green Beam™ is the most effective, energy efficient way to light mid-sized boxes. 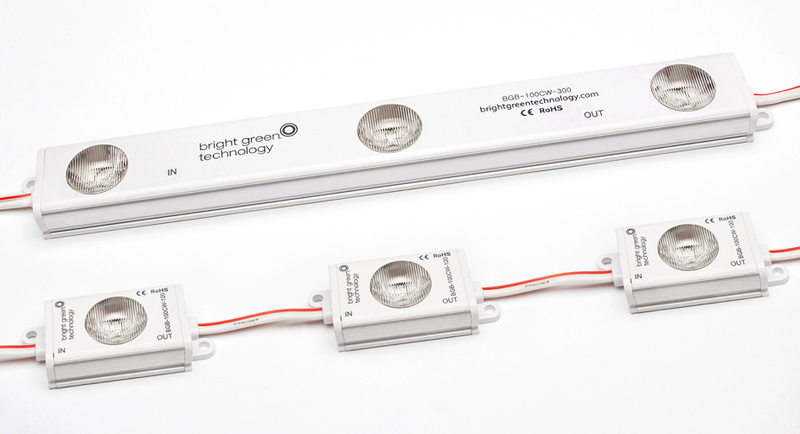 Bright Green Beam™ is available as either a one or three LED module to allow design flexibility and as an option of constant current or constant voltage. Available in Cool White ( 5700, 6500K), Neutral White (4000K) and Warm White (3100K) Bright Green Beam™ is a no maintenance, low power system that delivers energy savings of up to 88% compared with fluorescent tubes.